Donald Trump is not in charge. That much is clear. The federal government is in a civil war. The establishment forces behind business friendly stability are facing off against a chaotic administration. And on the outside, the third force—a popular movement with unprecedented scope and size and swiftness—waits to see if its demands will be met. It’s hard to know how all this will turn out. But one way it could end is with the elevation of Vice President Mike Pence to the head of the US government. Though this might pacify the establishment and bring some order to the executive branch, it’s frightening in its probable outcome. Pence is the most extreme right wing politician to ever ascend to the Vice Presidency. And he’s positioned himself well to take over. For this man to have risen so high in the administration may seem like a nightmare to half of the country, but for evangelicals with more faith in authority than democracy, it’s all part of the plan. Pence’s tentacles are wormed throughout the new administration. The former Indiana governor spent six terms in Congress, making alliances and friends throughout the hard-right fringe of the GOP now ascendant in the party. Pence was sworn into Congress in 2001. He served until 2013, when he became the Governor of Indiana. 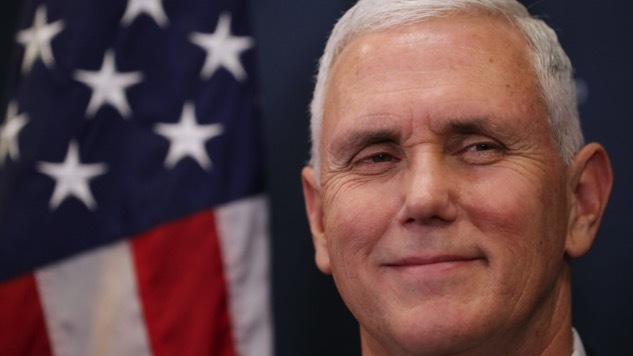 During his time in Congress, Pence developed a reputation as a hard right extremist uninterested in compromise. He was, put simply, a member of the Tea Party before the Tea Party existed. Pence’s time in Indiana was filled with the type of legislation one might expect after the opening days of the Trump administration. Pence attempted to bar Syrian refugees from entering his state, severely restricted abortion, and flouted public information laws with impunity in an attempt to undercut the press. When Trump picked him as his running mate in July 2016, Pence dropped his reelection bid and joined the campaign. On October 26, 2016, Pence told MSNBC that he was looking forward to working with his old friend House Speaker Paul Ryan and referenced a friendship of some 15 years. “We look forward to working with him,” Pence said. And work with him he has. Picking Reince Priebus as Chief of Staff is a good fit with Ryan’s goals. Pence lobbied for Priebus to get the position and it was widely seen as a good choice in the Beltway press for “getting things done.” Priebus and Ryan are longtime friends, even longer than Pence and Ryan—the two Wisconsinites met in the late 1990s. Ryan was slow to join the Trump movement. In May, Ryan was still cool to Trump’s overtures. Trump was not ready to support Ryan either. Wilbur Ross, a big-time GOP donor, pushed Trump and Ryan to kiss and make up. Pushing the GOP agenda forward was more important to Ross than Ryan’s fit of principled opposition to the billionaire. Now Ross is the Commerce Secretary nominee—Ryan’s statement when Ross was appointed was glowing. But it’s more than just Ryan. Pence is Trump’s inside man in Congress. He has relationships with many House GOP members, including Ryan, from a Bible Study Group he attended while representing Indiana in the House. Also in that group was Tom Price of Georgia, Trump’s Health and Human Services Secretary nominee. Price talked about his longstanding friendship with Pence in August. Pence gave out his personal cell to lawmakers after the election. A group of GOP Senators asked him to sit in on their sessions on a weekly basis. He’s keyed into the halls of power on Capitol Hill. And Pence has also reached out to members of the hard right fringe of the House. The Freedom Caucus is being courted by Pence in the hopes of solidifying a Republican coalition for his boss. That’s going to mean some conflicting views in the highest echelons of the federal government. Even Ayn Rand devotee Ryan ran into trouble from the Freedom Caucus in February over the budget. Further compounding the potential disputes is the nomination of Rep. Mike Mulvaney of South Carolina to head the Office of Management and Budget. Mulvaney is a key member of the Freedom Caucus and obsessed with cutting government spending. During Senate hearings, Mulvaney was asked repeatedly about the disconnect between his statements on the record and Trump’s rhetoric. His answers were non-committal. But it’s the Freedom Caucus whose philosophy is most revealing in looking at the Trump administration’s first chaotic weeks in power. Only three days before the election, The Washington Post reported that the House GOP were unhappy with Ryan, due to a perception of the Speaker as a sort of deal maker with Democrats. Expecting a Clinton win and a narrowed majority, the caucus wanted even more obstruction. The Freedom Caucus has always been about ideological purity, not governance. They’re not losing anymore. That’s clear in the chaotic, seat-of-the-pants nature of the Trump administration. Trump is governing with a mix of incompetence and malice, running the country through ideological fiat. Yet like the dog that caught the car, the Trump administration doesn’t know what to do with victory. The Trump administration is creating chaos and upheaval across the country and the world. On Capitol Hill, the GOP Congressional majorities Pence was supposed to work with are looking on in horror as the President obsesses over crowd size and media coverage instead of working to effect a Republican agenda. The gigantic federal bureaucracy has no input into Trump’s executive orders. Government officials are left to figure out how to implement the new laws—when there’s even law to be implemented. So the establishment has fought back. Meanwhile, the growing movement of resistance on the ground threatens to further destabilize and challenge this establishment. Trump achieved majority disapproval in eight days—the last guy didn’t hit that mark until 936 days. The new administration has been met with mass demonstrations in the swiftest forming national protest movement in American history. It’s possible Trump falls and Pence is elevated to the presidency. In this case, the media, political, and financial establishment will come together in peace. The people in the protest movement, bereft of a villain they’ve known for decades, may go home. And Mike Pence will quietly, but effectively, take control of a federal government he’s spent the last three months integrating himself into and begin to govern. It is imperative, therefore, that Trump’s fall not legitimize the political class in the eyes of the public and render Trump an aberration instead of a natural outcome of right wing politics. That will normalize and empower Pence. And that is unacceptable.